As mentioned in the Primer, the Far East isn’t on the eastern end of the base. It is in fact, on the western side and is the just east-ish of the Poo Pond. Consequently, the walk up to the Far East a few days ago did nothing to stimulate our appetites. Everyone in KAF is familiar with the Poo Pond. For those who haven’t visited our odoriferous little airfield I suppose I had better explain it. After a few years in KAF one sometimes forgets that not everyone is lucky enough to have one. The "No Dumping" Signs are ironic in a 13 yr old kinda way. 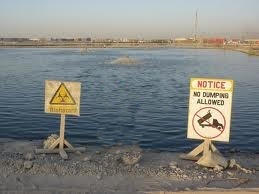 The poo pond was built when the Soviets were in Kandahar. It is a giant, round cesspool into which flows…well I think you get it. The stench can be overwhelming for newbies. After several weeks you get used to it though. It’s odd, but whenever we have visitors from our corporate HQ, everywhere we take them requires us to circumnavigate the poo pond with the windows open, stopping to wonder aloud “hmm, which way do we go again?” just as we find the “sweet spot” downwind. Ya gotta make your own fun here. The Far East has gone out of its way to be unique amongst the DFACs.It has lots of authentic Asian stuff on the walls…like the movie poster for the Spanish version of the Castle of Fu Manchu starring that famous Asian actor Christopher Lee. 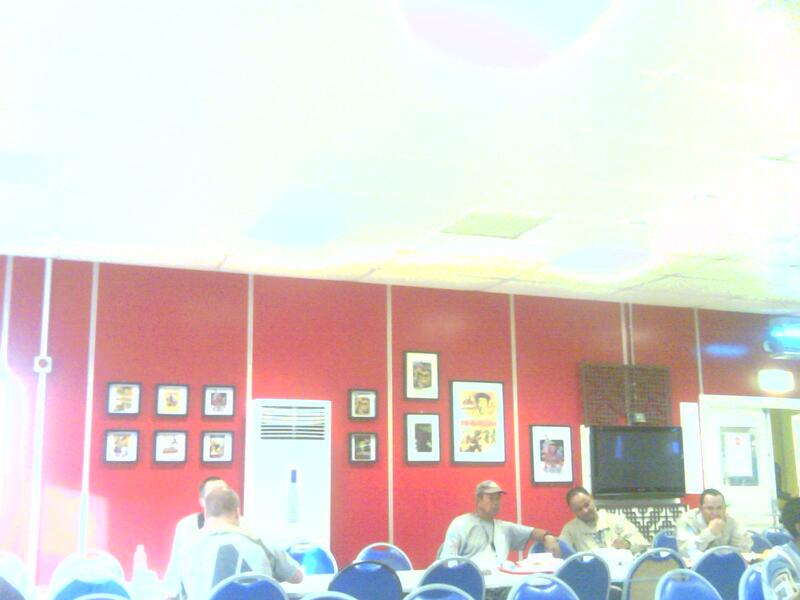 There’s all kinds of other things on the walls too, like fans and, well, lots and lots of red paint like one finds at $8.99 Chinese buffets throughout North America. Is this wise in a restaurant where about 80% of the people are carrying automatic weapons? 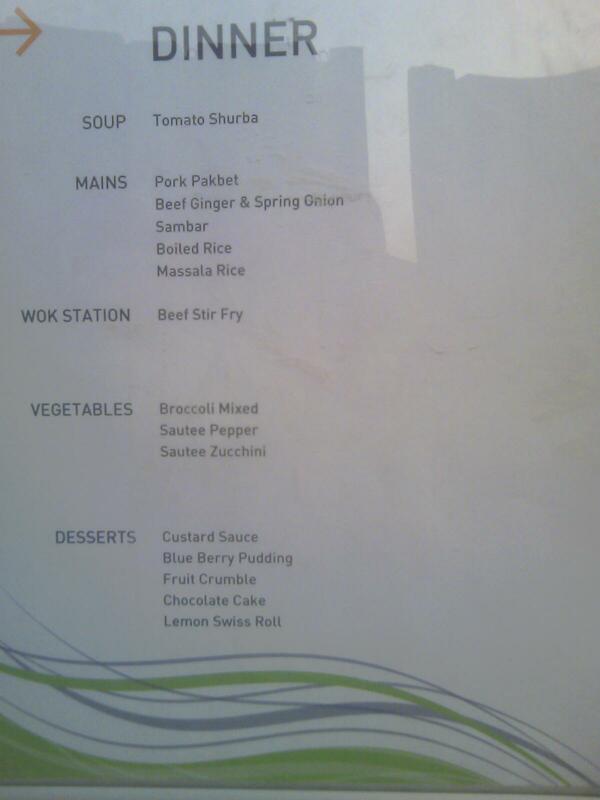 Well, I ended up passing on the Sambar…it was some vegetable dish that looked a little too gooey for my tastes. I did, however get a little bit of the other items. The chef did a great job getting all the dishes to be the exact same colour. There’s something to be said for uniformity…something like “ick”. He did manage to get the consistencies of the dishes to be very different. T felt that the meat in the stir fry was like chewing on string whereas I likened it more to stale gum. I was tempted to try blowing a bubble with it but hesitated when the thought of a beef bubble grossed even me out. The Beef Ginger Green Onion would have been more appropriately named Beef Monosodium Glutamate. It was so laden with MSG that it had the consistency and saltiness of wet seaweed. They should have saved some of this tenderizer for the stir fry. 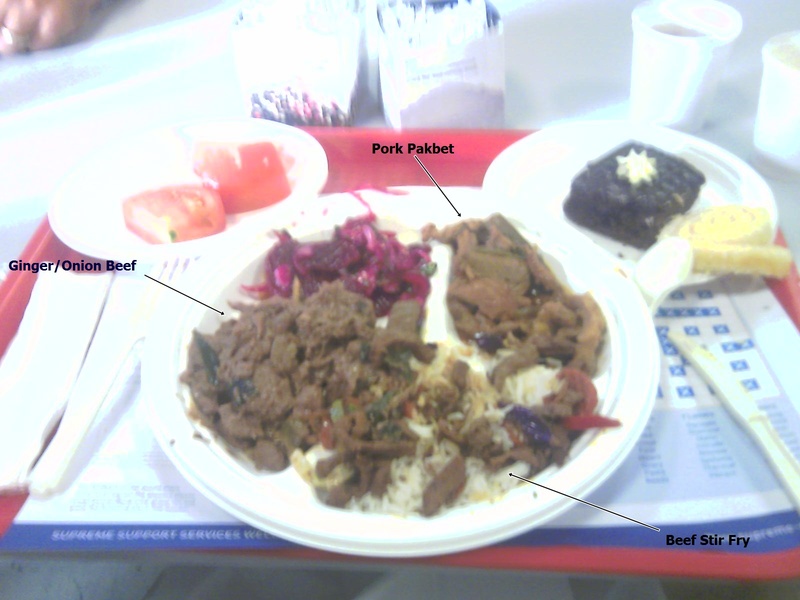 The Pork Pakbet was KAF-Ok and my pickled beet salad was quite good. M2 wasn’t so lucky on the salad front. He opted for some sort of cold pea salad. His suggestion of “Try some of these, they’re really bad” is something one would only hear in KAF. Dessert looked pretty good. I chose a slice of lemon Swiss roll and a piece of chocolate cake. Like most KAF desserts the Swiss roll was as dry as KAF dust. The chocolate cake, on the other hand was heavy and gooey. So much so that T likened it to eating “peabud bubba” or peanut butter as it is pronounced when one is not trying to eat KAF chocolate cake. If you want a stir fry, love MSG and don’t have anger management issues, the Far East is for you. This entry was posted in Far East by Kafoodie. Bookmark the permalink. Funny, I was thinking of making some Of that for dinner when you’re home. can get the recipe from the chef for that Pakbet and Sambar? Yet again Mark, I laugh out loud! PLEASE sell some country more UAVs…….I don’t know where I will get my laughs once you have departed KAF!